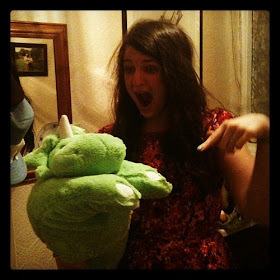 t*rexes and tiaras: Under the sea.. I made this dress up last Saturday and then wasted no time in wearing it, to the Sewing for Pleasure show at the NEC the very next day. I rather liked the idea of wearing something I'd made for the show and when this turned out a little better than I'd been expecting, I couldn't wait to give it it's first outing. 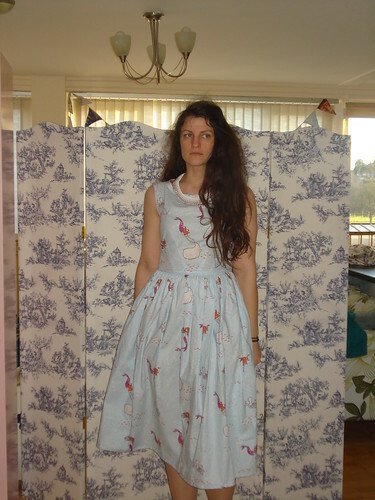 This was the first time I'd used the Simplicity 2444 bodice and then added a different skirt. 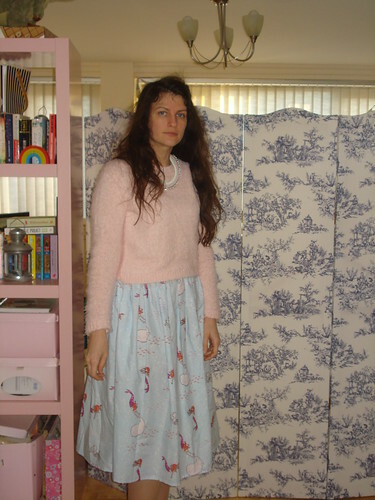 I just went for a simple gathered skirt, made from two 30in lengths of the fabric, at it's full width. This is the same method I've been using for putting my Emery dresses together. Very simple, but it seems to work. That said, I do wonder if I should have gone for a slightly shorter skirt, as I think the effect would be more full without the weight of the extra length. In the past I've used 25in sections. 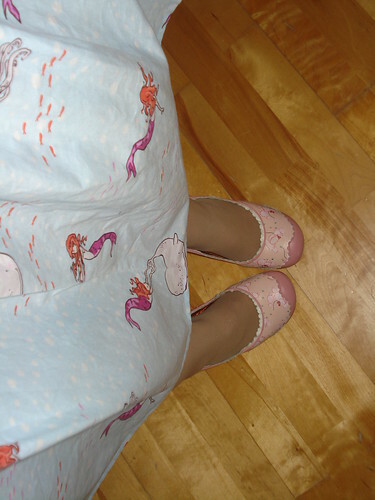 I'm quite a fan of the midi dress with heels, though, so I left it for the show and teamed it with some Irregular Choice pink wedges with a poodle print, which I don't recall wearing before. 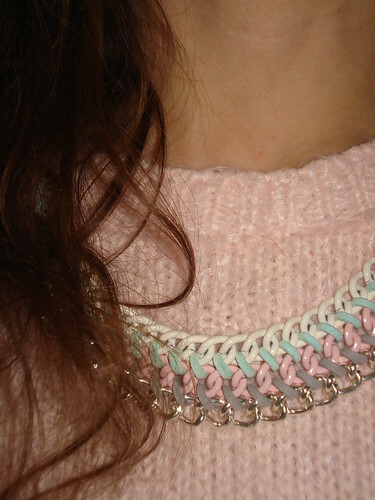 The pastel necklace was a £5 bargain from Primark and I really like the contrast between it's pastel colours and chunky chain detail. 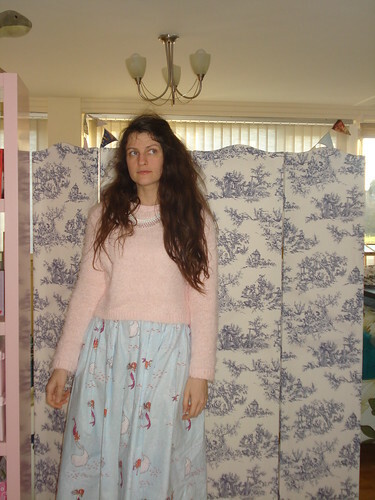 The pink cropped jumper was something I'd bought recently after seeing it on Rachel's blog. I love how she layers it over jeans, but I'm not a jeans girl so have been embracing the layering of cropped knits over dresses, particularly whilst the weather is still not that warm. 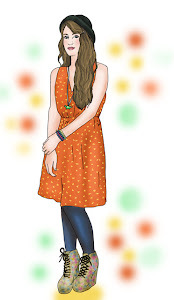 Thats a lovely dress Char. You are very talented hun. I keep meaning to say, I really love the room divider you have. Aww, thank you. It's been hidden away for a long while, it came from ebay several years ago, I think. Thanks, Melissa! This one was a Sarah Jane / Michael Miller one and came from Brighton Sewing Centre, as I was looking for this particular print everywhere. I tend to look on fabric websites more often now that the local haberdashery just seems to be getting more and more pricey.